Sexual Assault Rises At U.S. Military Academies An anonymous survey found 747 students suffered unwanted sexual contact in the last school year at the Army, Navy and Air Force academies. That's up nearly 50 percent from a survey two years earlier. 2017 graduation and commissioning ceremony at the U.S. Naval Academy. An anonymous Pentagon survey found that 747 students at the Navy, Army and Air Force academies experienced unwanted sexual contact during the past year, a nearly 50 percent increase from a similar survey taken two years earlier. Congress is keeping watch and the military has introduced prevention programs. Yet sexual assaults at military service academies keep rising. The leaders of those academies got an earful when they testified before a House Armed Services subcommittee on Wednesday. "After a decade-plus of concerted efforts to address sexual harassment and assault, the problem has only gotten worse," said Jackie Speier, the California Democrat who led the hearing of the Military Personnel subcommittee. "This isn't a blip, a 'me too' bump, or some accident. It's a clear illustration of a destructive trend and systemic problem." Cadets and midshipmen at the Army, Navy and Air Force academies formally reported 117 sexual assaults in the 2017-18 school year, up slightly from 112 a year earlier. The number has mostly been trending upward over the past decade. But what really grabbed attention was a separate, anonymous survey the Pentagon has been conducting every two years at the academies. A total of 747 students said they received unwanted sexual contact, up from 507 just two years earlier. That's a nearly 50 percent jump, and it also indicated that many victims are choosing not to make reports. Nearly 16 percent of women said they experienced unwanted sexual contact in the past year, up from 12 percent two years earlier. For men, the figure went from just under 2 percent to just over 2 percent. "I am frustrated and angered by the results," said Lt. Gen. Jay Silveria, the superintendent of the U.S. Air Force Academy. "The survey data shows that our cadets have been harmed. Too many feel they can't come forward for support." In the past, military leaders have attributed increased reports of sexual assaults as a sign that victims were more willing to speak up. But on Wednesday, Silveria and his fellow superintendents conceded that ongoing, multi-pronged efforts to prevent assaults have not been succeeding. "I wish I was here to tell you how we solved this, but I'm not," said Lt. Gen. Darryl Williams, the superintendent at West Point. Williams said he's ordered a "stand down" on Feb. 25, when all activity at West Point will come to a halt so he can address all the cadets on the sexual assault issue. The superintendents cited several factors contributing to assaults, with excessive drinking at the top of the list. The survey found almost a third of male students and 15 percent of the female students were self-described heavy drinkers, defined as consuming at least five drinks on days when they do drink. 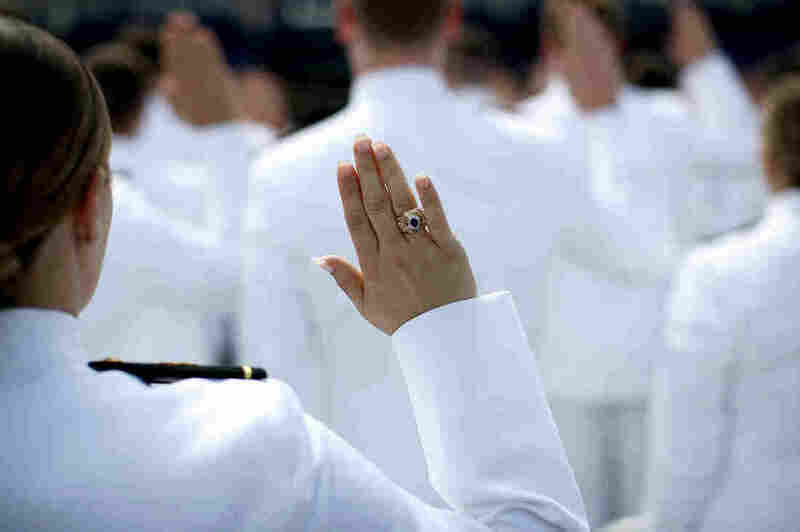 The survey indicated a solid majority of cadets and midshipmen have confidence in the senior leadership at the academies, but they expressed much less confidence in their peers, who take on many leadership positions as part of their training. Don Christensen, a retired Air Force colonel who also testified, said he believed many victims are reluctant to speak up due to fear of retaliation. He cited figures from the Air Force Academy, where some 200 students said on the survey that they faced unwanted sexual contact. 29 cadets formally filed reports. But most of those opted for "restricted reports" which provides victims with medical care and counseling, but does not trigger an investigation. Just nine cases were prosecuted, and only one resulted in a conviction, said Christensen, who now leads the private group Protect Our Defenders. Those who file cases can face harassment, he said. "Bullying the victim on social media is a real problem," said Christensen. While the military academies have been tracking sexual assaults for years, officials say it's difficult to make a direct comparison to civilian colleges and universities, which generally don't produce similar reports.